Afterwards, the general public will be able to sponsor having a flag made into a practical item, such as a sleeping bag or quilt. Their sponsorship will go towards Alabaré’s Homes for Veterans, helping to change the lives of Armed Forces Veterans who are homeless and vulnerable. 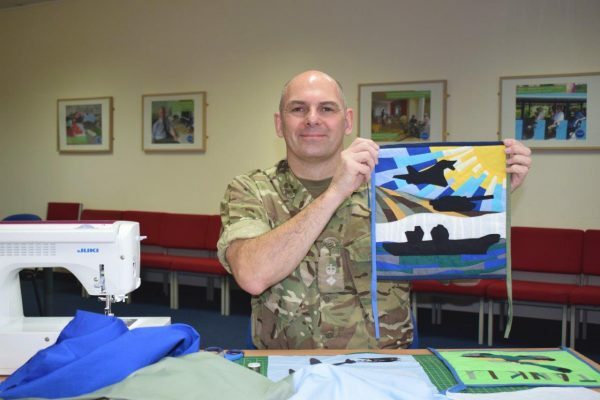 Lt. Col. Neil Stace, also known as the Sewing Soldier following his appearance on the BBCs Sewing Bee, will be spearheading the project, running workshops and transforming the flags into quilts, sleeping bags and ponchos. For more information or to arrange an interview call Harvey Taylor on 01722 344485. At Alabaré we support people to overcome the barriers of homelessness, mental ill-health and learning disabilities in-order to have a home, health, choice and independence. Alabaré Christian Care and Support provide the highest standards of accommodation and support to disadvantaged and vulnerable people in our communities in order that they can have a home, health, choice and independence. Since 1991, Alabaré have been working with people facing disadvantage through homelessness, mental ill-health, learning disability or a combination of these. We provide housing and personalised support based on the individual needs and aspirations of each person, tackling underlying causes and giving them the skills and confidence to move forward with their lives.